Multiple (concurrent) races on a single map. Running, Bike, Nordic, mixed disciplines (eg Triathlon) and more. 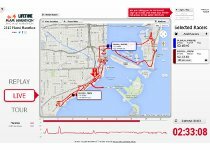 Multiple courses, multi-segment races with transitions and multi-stage events. Course Markers (Water/Food Stations etc), Distance Markers and Points of Interest. Live Streams from official timing pads. Chip-time, Wave and Mass starts. 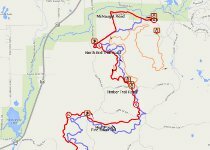 Racers' locations projected from last known pace. 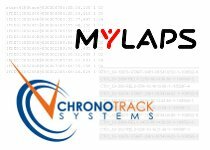 ChronoTrackTM and MyLapsTM timing systems supported. Automatic and/or Manual "You Are Here" marker. Estimated Time (ETA) for your racers to reach spectator. ETA with laps/loops and multiple passes. Desktop and Mobile web app available on same url link. Mobile has same functionality as desktop version (except Elevation profile) but is optimized for the mobile platform. Event's color scheme, logos and branding. Custom racer and map marker icons. Choice of display formats for distance, altitude, pace and other values. Custom display layouts available for Premium Events. 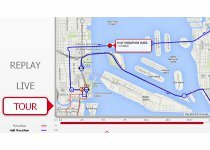 View all event courses prior the race day. 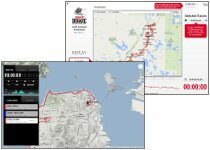 Replay event with Official results. Jump to different parts of the course and adjust tour/replay speed. Elevation profile (available on desktop version). Managed remotely - no on-site presence required. Our streaming servers can process Live data from ChronoTrackTM based systems via Stream Manager. Our streaming servers can process Live data from MyLapsTM based systems via ToolKit. Please contact us for compatability with other timing systems. Track friends and family Live. 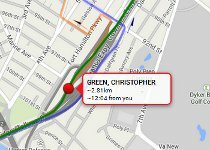 Automatic location detection (if available and permissioned on device). Manual location setting also available on all platforms. 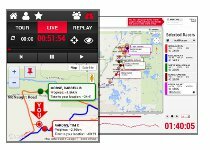 Used in conjunction with Live splits to calculate Estimated Time (ETA) for your racers to reach you. Estimated Time (ETA) for your racers to reach you (as an on-course spectator). ETA for racers in different races. ETA for laps/loops and multiple passes. Based on racers' last known pace. 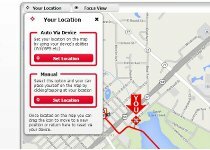 Friends and family can track you location Live. Set up a Profile and add a target time. 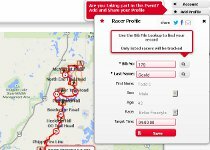 Share a direct autoloading link of your race with friends and Family. You would like us to put your Event on our Map. You would like to arrange for a full demo. You would like to arrange to test your systems against our streaming servers. You use/represent a Timing System not currently supported and would like it included. You have any other questions regarding RaceMyRace and our feature set - current or wish list. You have any queries on Live race days. You have any questions about your membership and/or racer profile. All image screenshots from Google Maps are Copyright Google. All other trademarks appearing here are the trademarks of their respective owners.